We have a limited supply of mysterious rectangular bevels to tell you about. They are mysterious because we don't know where they came from. They were probably acquired in the 1970s by way of a legendary fellow named Bernie, of whom people here speak in only hushed tones. The bevels are of an unusual size and fall into the "odd" category, but odd is the new normal these days, is it not? We are sure those clever and creative minds of yours are already calculating a multitude of ideas for their use. You could try your hand at creating a mosaic tray with one of these bevels as the base, or you could use etching stencils to create a beautiful design. They are all 3/16" thick, and are generally large, up to 20" long, so do not be surprised if your shipping costs are a bit high. They are all clear with a beveled edge of a variety of widths. 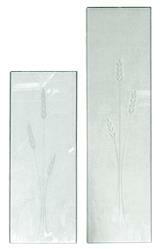 These large pieces of 3/16" glass have finished edges, and each have three sheaves of wheat deeply etched into them. We can imagine them being used as the centerpiece of a larger stained glass or fine woodworking project. Or simply lay them flat on your dining table and use them as large, handsome trivets. Two sizes: 5-3/8" x 14" and 5-1/4" x 20". Our "Tiny Bevel" series of bevelled glass pieces are so small that the bevelling must be done by hand. This adds to their charm because, as a result, each one differs slightly from any other. The 8 pieces with which we have chosen to begin our series can be combined in many ways to create a seemingly endless array of suncatchers.